Welcome to CILC2013, the fifth edition of the international Conference on Corpus Linguistics organized by AELINCO, the Spanish Association of Corpus Linguistics. 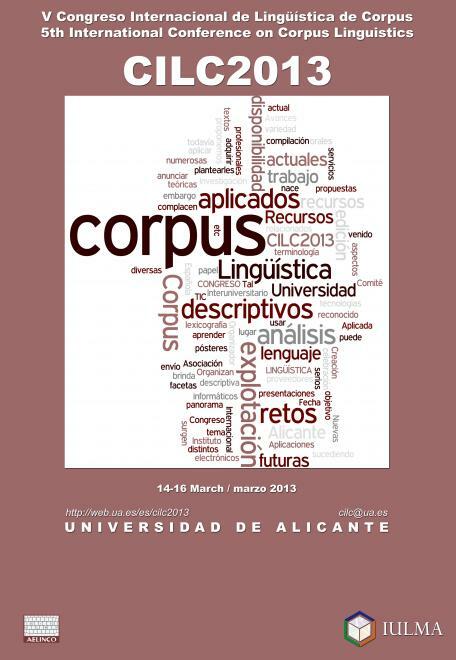 This edition of the Congress will be held at the University of Alicante, from 14 to 16 March 2013 and is organized by IULMA. Abstracts must be sent in English or Spanish and be a maximum of 550 words. Please note that the full paper must be presented during a maximum time of 15 minutes (with 5 minutes for discussion). Abstracts for poster sessions (A1) will also be accepted. The abstract proposals should be related to one of the conference panels outlined by AELINCO. Each panel has a director who shall communicate the acceptance or rejection of the proposals after its evaluation by experts. How to send proposals is specified in the first circular and proposals submission. The deadline for submitting proposals has been extended until January 21, 2013. For further information, please check the corresponding links on the web page of the Congress.